Description: End unit! 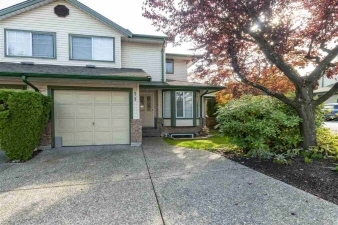 Located in emerald estates and just minutes from topham elementary, shopping, parks & walnut grove's rec centre this 4 bedroom home boasts over 1900 sf and is perfect for the growing family. The main floor has a large living room with a gas fireplace and access to your private patio (great for bbq), a formal and informal dining area, a bright efficient kitchen with white cabinets, s/s appliances, and granite counters. The upper floor features 3 bedrooms and 2 full baths. The basement is well laid out and includes a large games room, full bath, bedroom, laundry room plus a separate storage room single garage plus 2 extra spaces in driveway (perfect for truck parking). Private setting. Low strata fees. Pets allowed.